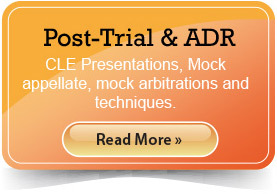 Identifying and Communicating the Critical Elements of Trial Litigation. Using the facts to tell your side of the story is part art and part science. We help you with both. Understanding the needs of your witness. Every witness is different. 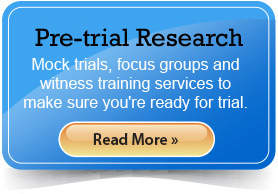 We help prepare witnesses for depositions and trials based on the individual's needs. There is a difference between telling the truth and telling the truth effectively. Knowing what your case is worth. Our focus groups and mock trials are the best in the business because they are specifically designed to elicit the information that is critical to your case. Picking a jury and recognizing their perspective. We all have biases. Knowing how biases will affect the outcome of your case is critical. We assist you with demographic studies, thematic development, case presentation and jury selection. Whether you are making your argument to a jury or a mediator or arbitrator, you only have one shot at making a powerful first impression. We can assist you with all aspects of your trial presentation from Openings to Closings and preparing your case for mediation. Trial Consulting Enterprises is a full-service jury consulting firm that handles bet-the-company litigation from coast-to-coast. TCE offers a full range of litigation consulting services designed to help our clients achieve optimal litigation results. TCE has handled virtually all types of civil litigation. From aviation to patent disputes, single plaintiff cases to mass tort litigation, TCE's expertise covers all aspects of the legal arena. With thousands of hours spent selecting juries, facilitating focus groups and mock trials, and studying juror feedback in cases across the nation, TCE's depth and breadth of experience means that you will receive the very best information possible to help you win your case. Regardless of whether you are trying your case before a judge or a jury, winning all comes down to a listener's understanding. 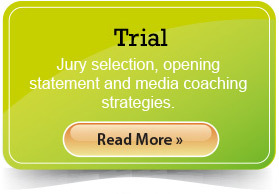 What do you want jurors to understand about your case? It is not who speaks first that is important. It is who is being understood first. "Mary, I wanted to thank you again for the great job on the part of you and your entire team. I was very impressed with how smoothly, professionally and thoughtfully the entire day went." "Thanks again for all your help this weekend. Everything went so smoothly and your staff was so great. We really appreciate everything. The client and insurer were also very pleased." "Mary, the way you conducted your focus group discussion is amazing. We got so much information. We look forward to working with you again." "In 2002, we were representing Lufkin Industries, Inc. in a patent infringement case, which was transferred to Wichita Falls from Dallas just before trial. After trying to get a local counsel, and finding out that most of Wichita Falls firms did work for the Plaintiff, I decided to hire a jury consultant. Mary Griffitts was the answer. She immediately engrossed herself in the case in order to validate and where necessary modify our theme points, and attended the entire trial. She not only helped with picking the jury, but spent every day helping to prepare our witnesses so that they would make the best possible presentation to the jury, and they did. Her consultation with me as the lead trial lawyer came not only every evening, but during every break. Her assistance and work with our entire trial team was extraordinary. She's the best!" "You need Mary on your team, not working against you." "Mary Griffitts and her team deliver. It is just that simple. In over 20 years of using experts and consultants on a nearly weekly basis, Mary is at the head of the class. For example, her insight and input not only refocused the trial team, she got the client's full attention. Her professionalism, intellect, and good nature makes her a pleasure to work with. Certainly these are factors, but the simple fact remains that her efforts saved my client millions of dollars, and in the end that is the touchstone." "Mary, your insights were amazing. I’m looking forward to working with you on the next big case." "Mary's work on a complex aviation matter was instrumental in the development of our client's case. Her analysis was on the mark and offered great insight of the issues." "Invaluable, wonderful, helpful, focusing, thoughtful, precise...what else can one say about the services received from Mary Griffitts and Trial Consulting Enterprises. She and her staff were on target on their comments, suggestions and ideas. They never meddled, they only raised issues - just what a trial team needs. Use them again? I could not be without them again!" "Your participation at the NITA program changed my mind. I restructured the entire program to include YOU in it because I was so impressed (and your ratings from the law students were wonderful; likewise their comments). I picked you because a)I like you as a person, b) I like your approach, c) I trust you to teach at a level that would not insult them, and d) you are very very good at what you do! I also like the "star" patina you convey and the charisma you wear so well." "As in many cases, the simple fact that a corporate executive is sued causes a great deal of frustration and outright anger. Mary and her team worked closely with the executive to help him to be calm and collected for his deposition testimony. As the case approached trial, Mary's assistance allowed him to communicate effectively and with a great deal of persuasion. Her witness communication training was excellent." Over the past 30 plus years of product liability trial practice, I have worked with several notable trial consultants. Mary Griffitts and Trial Consulting Enterprises now tops that list. She has conducted focus group jury projects for my clients and me and has been right on with focusing our defense theme and identifying favorable and unfavorable juror profiles. She has continued to work with me from opening statement through closing argument and has become my most valued critic in helping me maintain the case theme throughout trial. One of the more valuable and innovative activities that she helped organize and conduct was a pretrial meeting with key experts and significant company witness to assure that all were attuned to the case theme and storyline. Thanks, Mary!! You are the best! "You were able to shape my opening/closings/and cross such that the story was effectively communicated to the jury. I am just in awe at your talent and instinct and so very grateful for your help." "To be honest, I was skeptical at first because in the past I have not been overwhelmed by the work of jury consultants. Your approach was vastly different from what I had seen before and therefore the results were demonstrably more useful. You made an instant connection with the jurors and you were able to use that for the balance of the day to ensure a constructive dialog over what I thought would be boring and tedious issues. You found a way to frame the issues in a way that made it understandable for the jurors and useful for the lawyers. I would not hesitate for a moment to use you again or recommend you to other clients and lawyers." "Talk about a reality check! Mary’s team provided constructive criticism that allowed us to have greater insight into the pitfalls of our case. Her suggestions gave us a roadmap of what points to change, what evidence to emphasize and most important what kind of juror would be most receptive to our case. Mary’s advice was invaluable and I could not have been more pleased. I will use her again and recommend her to other lawyers without hesitation." Mary helped our trial team put together a solid theme for our Railroad Crossing / Train fatality case. Mary assembled a Focus Group that greatly assisted us in narrowing down the core issues of our case. The Focus Group was a true success and thoroughly tested our case, giving us an accurate idea as to the strengths and weaknesses of our case. She also assisted in formulating a game plan for trial, including the order in which to call our witnesses, and how to specifically address the weaknesses of our case to minimize any negative impact on the jurors. Mary provided our firm with an environment conducive to learning and enjoying the experience. Her team was very professional and provided invaluable insight to our case. I look forward to working with Mary again in the future. Thanks again for preparing and hosting an excellent focus group. Having now done it twice, it is a superb way prepare the case, well ahead of the real thing, and test out theories. In this case, your team put together a very representative Philadelphia jury which I was very glad to see. The group discussion at the end of the day provided extremely valuable and insightful feedback.